Here is an essay by a psychology professor, Dr. Joseph J. Horton, about the well-known case of 11-month old Charlie Gard in a London hospital and a severely burned 11 year-old boy from South America who is now undergoing painful treatments in the USA. The European Court in Brussels failed to overturn the British Supreme Court’s ruling allowing hospital doctors and administrators to disconnect Charlie from a ventilator because it might be causing him pain (and allow him to die), rather than allow Charlie to be treated by an experimental method in America. Dr. Horton’s thoughtful article comparing the two cases is worth reading. Click on the link to read it. Here is the latest news article about the Charlie Gard case, with quotes from the parents, a British judge, New York-Presbyterian Hospital and the Vatican’s Children’s Hospital. With the allegations receiving public attention, the CSD appears to be finally encouraging GHCHS to take action. The current version of the GHCHS website has moved the IEP and 504 Plan from the list of required documents. Instead, it states that they are “voluntary documents which can be provided after enrollment.” Unfortunately, this still appears to violate the terms of their charter which states that “Granada Hills Charter shall not request or require submission of a student’s IEP, 504 Plan…prior to admission” (emphasis mine). This language is contained under “Non-Discrimination” in the charter and is meant to ensure students with disabilities are not dissuade from enrolling. The creative use of language to change the point in the process when the school wants these documents turned over does not change the fact that the request is still made on an information sheet about enrollment. If Cole-Gutiérrez is serious about his promise to “follow up on these specific cases”, then any mention of the IEP and 504 will permanently disappear from the enrollment page. Eager to step off in a different direction, Donald Trump “did not bow to the Gulf leader” as he stepped off of the plane in his first trip outside a Trump property since taking his oath of office. Instead, he waited until later to present a move that started as a bow and then transitioned into a curtsy. “Fox News’ foreign policy ‘expert’ Rebeccah Heinrichs” points out that Melania Trump “didn’t cover her head”, providing a “metaphor that this President is not ashamed of the United States, we do care about human rights, we do care about the women in Saudi Arabia.” Replacing the snub that Obama received, Trump received a hero’s welcome that played to his hyperextended ego. His face was “plastered on billboards around the city”, they fed him “lavish meals” and “a five-story image of [his] face was projected on the exterior of the Ritz Carlton hotel where he’ll stay”. Giving the low-energy President a break, the Saudi people voluntarily spared him the inconvenience of having to deal with protesters. All Trump had to do to regain the respect of the Kingdom and out-maneuver his predecessor was to pay the small price of selling out American values. For decades, “American officials [have] complained about the shameful state of human rights in the kingdom, where women are restricted, critics are lashed and beheadings are common.” But while “Obama made human rights part of his message when he visited Saudi Arabia” and his Secretary of State, Hillary Clinton, “helped seek the release of an activist, Manal al-Sharif, who helped start a women’s right-to-drive campaign”, Trump took another tact stating that “we are not here to tell other people how to live, what to do, who to be, or how to worship.” Like the despotic leaders of the Philippines, China, Turkey, and Egypt, Saudi leaders have been shown by the Trump administration that “topics like democracy, political reform and gender equality” have been taken off the table. Trump knows that they “push gays off…buildings…kill women and treat women horribly”, but they are free to do so as long as they keep buying our weapons. Also missing from Trump’s pronouncements in Saudi Arabia was his 2014 demand that they provide us with “free oil”. 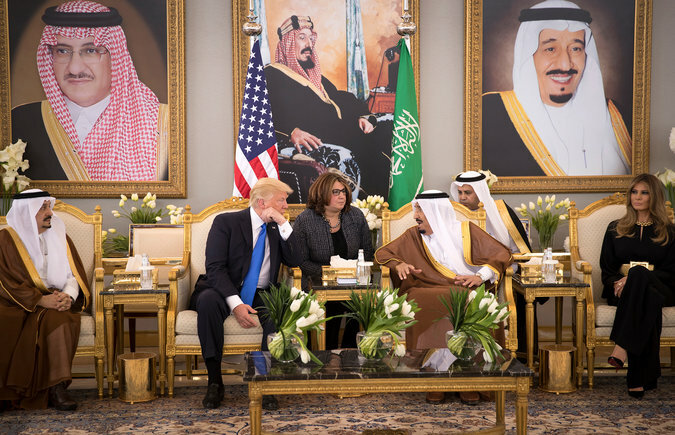 While Obama was willing to take on Saudi Arabia’s status as a “free rider”, Trump reserved that kind of talk for our democratic allies in NATO. Months into his presidency and he still has not figured out that this is not a dues-paying organization and embarrassed himself, and our country, by insisting that “many of these nations owe massive amounts of money from past years and not paying in those past years.” He then compounded this embarrassment by not mentioning “any clear statement of support for Article 5, the NATO mutual defense pledge — something other leaders had been hoping to hear”, even as he presented a remnant of the North Tower of the World Trade Center – a symbol not only of a great national tragedy but the only time in history that the Article has been invoked. Trump then proceeded to push past the Prime Minister of Montenegro to get in place for a photo shoot of the assembled heads of state. #AmericaFirst. Back at home, Trump’s fans are too busy continuing to litigate the last election to notice that their leader is quickly abandoning his promise that “the forgotten men and women of our country will be forgotten no longer.” With Trumpcare, he jettisoned the promise to “keep pre-existing conditions.” Moreover, the Congressional Budget Office estimates that “the bill would cause 23 million fewer people to have health insurance by 2026.” While they congratulated themselves on the stroking of Trump’s ego, their President released a budget that cut “Medicaid effectively in half by 2026” and “up to $64 billion over a decade from the Social Security Disability Insurance (SSDI) program”. So much for the promise that there would “be no cuts to Social Security, Medicare & Medicaid.” And if American Workers thought that the arms sale agreement with Saudi Arabia was going to bring more jobs, they had better like the heat of the Saudi desert; “the agreement includes a pledge to assemble 150 Lockheed Martin Black Hawk helicopters in Saudi Arabia, a $6 billion deal that will create new 450 jobs in Saudi Arabia.” How will that make America great again? Perhaps Donald Trump’s greatest talent is his ability to feed fake news to his fans without interference from the mainstream press. In his signature move, he piles on a bunch of smaller lies and then follows up with an outrageous statement. The press then covers the controversy while ignoring the other nuggets. Meanwhile, his base reads them, sees that they have not been refuted and accepts them as truth. Perhaps this is one explanation for the fact that while his approval rating sits at a historically low 42%, only 2% of his voters regret their decision. If Trump is not lying with this opening statement, then he is surely delusional. The hundred-day was initiated during the FDR administration as he responded to the crisis of the Great Depression and acted accordingly. Obama faced a Great Recession that was threatening to deepen and acted quickly by ushering in a stimulus package. Even if Trump had the ability to display this type of leadership, the circumstances of a deep, overwhelming crisis do not exist that would enable him to unite the country around a solution. Trump was handed an economy that “has gained jobs for 75 straight months – the longest streak on record.” When Obama left office the unemployment rate stood “at 4.7 percent”. To put that in historical perspective, “in all the months since 1948 the median jobless rate was 5.6 percent.” Therefore, to say that Trump is “bringing BACK jobs” is in itself a violation of the truth. While Trump likes to take credit for everything good that has happened since the beginning of the year or even since his election, there have only been two full months of economic reports since he actually took office. The February jobs report showed that 237,000 jobs were created in the first full month of Trump’s presidency, 1,000 LESS than the amount that was created in February 2016. “Employers pulled back sharply on hiring in March”, creating only 98,000 jobs. In March 2016, 225,000 jobs were created. The “gross domestic product increased at a meager 0.7% annual pace in the first three months of the year, down from 2.1% and 3.5% in the back half of 2016.” This was the “slowest growth in 3 years”. According to TransCanada’s bid for the permit, only 50 permanent jobs will be created to maintain the Keystone pipeline. It will also increase our trade deficit as it will be built to import Canadian oil into our country. “Just 40 full-time permanent positions will remain upon the conclusion of construction on the DAPL”. Despite previous assurances, neither project will require using American made steel. As of today, 1,093,105 people have signed a petition at WhiteHouse.gov calling on the administration to “Immediately release Donald Trump’s full tax returns, with all information needed to verify emoluments clause compliance”. The information has not been released. This sounds like a policy developed by a second grader. While burdensome regulations that have not proven to be effective should be repealed, this policy assumes that all regulations were created equal. It is unclear how lifting a ban on the use of lead bullets on federal lands will unleash job creation, but this is an example of one of the environmental protections that Trump has taken. Merrick Garland is a moderate judge who should not have been nominated by a liberal President. However, like every other compromise that Obama attempted to make with the Republicans, they rebuffed the effort and refused to consider his nomination claiming that there was a “rule” that stated that “the Senate would not confirm a Supreme Court nominee in the middle of a presidential election year”. Now the administration brags that it has been 136 years since there was opening for an incoming president as he took office. The Senate was clearly following a precedent that did not exist. “Confidence” is an abstract item that does not result in any actual data. Remember that the same polls that are measuring this hopefulness are also showing that people continue to be fearful even as the crime rates fall. If job growth continues to lose steam, Trump may very quickly find himself in a situation where he is dealing with confidence bubbles that are popping around him. In the meantime, they are a pretty good indication that his talents as a master manipulator may be unsurpassed. P. T. Barnum would be proud. When looking at reality, Trump’s start doesn’t stack up to Obama, never mind the entire historical record. Unlike Trump, Obama won the popular vote and in 2008 received 365 votes in the Electoral College. Even if Trump’s claim that a “million and a half people” is true (one estimate puts the actual crowd size at 250,000), it still would not have been as high as the 1.8 million who are estimated to have attended the 2009 inauguration. The 100-day marker was initiated during the Franklin Delano Roosevelt administration when “more than a dozen sweeping laws were enacted in that time as FDR threw the public purse behind the cause of industrial recovery, agricultural renewal and public works, expanding federal powers in the process.” Trump has yet to log a single legislative victory. In comparison, Obama signed a “$787 billion stimulus plan, an ambitious package of federal spending and tax cuts designed to revive the economy and save millions of jobs” during his first 30 days on the job. None of these facts will matter to die-hard Trump supporters, too many of whom are still not convinced that Obama is not a Muslim terrorist born in Kenya. Trump’s one business talent has been brand building through hype and he has applied this to his political career. If you build an alternate reality, they will come. While a single brick has yet to be laid across our southern border, he has used this alternate reality to construct a wall across our country’s vast political divide rendering debate useless. Provided with facts that render your position incorrect? Just declare the source to be Fake News. Your National Security Adviser caught not reporting contacts with Russian officials? Claim that the real crime is that Americans were told about this possibly illegal activity? Your presidency the biggest American failure since the Edsel? Try to distract with some perceived transgression of Obama. Or Clinton. Or (for some reason) Arnold Schwarzenegger. Had Trump remained in his previous career in reality television, this would have made for highly-rated entertainment. Unfortunately, it is reality life and real people are going to be hurt. The Muslim refugees affected by Trump’s actions “preventing muslim immigration” are real, not extras in a movie shoot. The 24 million Americans who will lose health insurance under Trumpcare are not plot points in a medical drama. As the Earth warms, the effects of storms like Sandy will not be CGI generated special effects. Since logic does not seem to convince Trump’s supporters of the dangers of his policies, is there anything that can be done to eliminate the threat they represent? After 100 days, “96% of people who…voted for him [say] they would do so again”, so it does not appear that anyone has found a way. I hope someone does before the damage becomes irreparable. This week, Granada Hills Charter High School (GHCHS) will attempt to win its sixth national Academic Decathlon championship in seven years. If this were a high school sports team instead of an academic one, the improbability of this accomplishment would probably be more of a focus but instead, it is blindly celebrated. No one seems to ask how it possible for a school that is supposed to draw from surrounding neighborhoods to consistently dominate a competition in a way that can only be compared to the winning streaks of the Harlem Globetrotters or the USA’s Olympic basketball Dream Teams. There is no doubt that members of Granada’s team work hard to achieve their success, but does the demographic makeup of this school give their team an unfair advantage? The population that GHCHS’ Academic Decathlon draws from has a higher percentage of students classified as “Gifted and Talented” than any other neighborhood school in either its geographic region or in a group of schools the District considers to be comparable. While students with this designation in the 2012-13 school year represented 5% to 20% of the population in nearby resident schools, they represented a staggering 43% of GHCHS’ student body. The median was 25% for comparable schools. Students at GHCHS were also less likely to be classified as needing special education services. In nearby resident schools, 13% to 16% of the students needed these services but only 6% of Granada’s students received them. The median was 11% for comparable schools and El Camino Real Charter High School was the only neighborhood school with a lower percentage at 5%. The three large LAUSD conversion charters, GHCHS, El Camino and Palisades Charter High tied for the neighborhood schools with the lowest percentage of English learners at 3% each. The median for both nearby and comparison schools was 11%. At Cesar E. Chavez Learning Academies, these students represented 19% of the population. Since GHCHS enrollment procedures include requirements to discourage harder to educate students from enrolling, it is not surprising that the population at GHCHS is skewed towards Gifted and Talented. Executive Director Brian Bauer denies that birth certificates, report cards, 504 plans, and IEPs are “required for enrollment”, but they are clearly listed as “mandatory documents” on paperwork that is provided to prospective parents. According to Bauer, parents should read between the lines to determine that this “enrollment document implies (emphasis mine) that there is a means of enrolling” even if these documents cannot be submitted. Curiously, he even states that “there is no ‘pre-enrollment’ process; there is simply a single enrollment process” when the enrollment sheet clearly directs parents and guardians to a web page that has the heading “Pre-Enrollment for Incoming Students”. GHCHS operates under a charter that states that it “shall not request or require submission of a student’s IEP, 504 Plan, or any other record or related information prior to admission, participation in any admissions or attendance lottery, or pre-enrollment event or process, or as a condition of admission or enrollment.” This is included to prevent the appearance of discrimination against those with special education needs. By flagrantly ignoring this requirement, the school sends the message that some students are not welcome which changes the makeup of its student population. Not only is this unfair to its competitors in the Academic Decathlon, it skews any comparisons made to public schools which serve ALL students. There is no doubt that Trump’s Education Secretary, Betsy DeVos, is a clear threat to our public education system. Despite “analysis [that] has shown that charter schools [in her home state of Michigan] perform more poorly than public schools”, DeVos has not only pushed to grow the charter industry in the state, but also fought to ensure that charters are not held accountable for the public funds that they receive. For example, last summer, “the DeVos family contributed $1.45 million over two months…to Michigan GOP lawmakers and the state party after the Republican-led Legislature derailed a bipartisan provision that would have provided more charter school oversight in Detroit.” And now Trump has given her the opportunity to spread policies that are “destroying learning outcomes” nationwide. The foundation of charter growth in the LAUSD was partially built by current Congressional candidate, Yolie Flores, who is also a Democrat. As an LAUSD Board Member, Flores introduced the misnamed “Public School Choice” resolution which let “charter management organizations apply to run new schools.” Knowing that this resolution would not be passed if it was appropriately labeled as being for the benefit of charters, e-mails attributed to Flores warns that messages supporting its passage “are emphasizing the charter aspect” and ask for “help in communicating to the Charter community that we cannot make my resolution about charters.” Similarly, her campaign’s website claims that she “will fight to protect public education” with no mention of charters. Educated voters should see past the obfuscation. Carl Petersen is a parent and special education advocate and was a Green Party candidate in LAUSD’s District 2 School Board race. He was endorsed by Network for Public Education (NPE) Action and Diane Ravitch called him a “strong supporter of public schools.” His past blogs can be found at www.ChangeTheLAUSD.com. Many protests against this executive order occurred over the weekend, with mostly one-sided news coverage. Here is an insider’s view of the Presidential executive order from James Carafano, Heritage Foundation VP, who worked on this issue on the transition team since the Republican convention. Carafano describes the thought process behind the order, and describes vetting procedures similar to what is already in place in the European Union to prevent terror attacks. January 6 is Epiphany, traditionally marking the visit of the Wise Men on the 12th day after Christmas. Orthodox churches around the world still celebrate Christmas on January 6 or 7. The Armenian Apostolic Church observes Christmas on January 6, while many Eastern Orthodox Churches celebrate Christmas on January 7, the date on the Gregorian calendar which corresponds to 25 December on the Julian Calendar. Below is Matthew 2, the true story of the Wise Men’s visit to Bethlehem. People have a tendency to combine things for convenience. Although Christians celebrate the coming of the Wise Men at Christmas, the Magi came to a house at least a year later to worship a little boy, not the stable on Christmas Eve. Careful reading of any translation of Matthew Chapter 2 makes this clear. Martin Luther’s translation (below) of Matthew Chapter 2 from the original Greek is especially clear. This chapter has three messages in dreams with direct instructions from God and two fulfilled Old Testament prophecies. After the Wise Men had their encounter with the tyrant king, they visited Bethlehem and were warned in a dream not to go back to Herod. Joseph got specific instructions from the angel of the Lord in a dream to flee to Egypt, which he immediately obeyed. He did the same for the return to Israel after Herod’s death. The Babylonian astrologers/astronomers told of a star which had guided them to seek “the newborn King of the Jews.” This miraculous star has been the subject of much speculation. If this theory is true, it’s either a huge coincidence or God orchestrated the motions of planets to coincide with the birth of His Son. Astronomer Hugh Ross, astrophysicist Jeff Zweerink, and philosopher/theologian Kenneth Samples were interviewed about this popular movie by Reasons to Believe. Ross says it may have been a more subtle sign for it not to have been mentioned in extra-biblical records. You can read the full interview here. Or it could have been a direct supernatural miracle, no big deal for the Creator of the universe. Either way, the timing of the Incarnation went perfectly according to plans laid long before it happened – the Bible says before the foundation of the earth. However it happened, the star prompted a long trip with expensive gifts by respected men and their entourage. It’s not known if there were three Magi, but since three gifts are mentioned that’s what people assume. Wise men worship the King of kings; a tyrant king is foiled. When Herod the king heard this, he was terrified and with him all Jerusalem, and he asked all the high priests and scribes of the people to come together and investigated from them where the Messiah was to be born. When now they had heard the king, they went there. And see, the star that they had seen in the East proceeded before them until it stood over the place where the little Child was. When they saw the star, they rejoiced greatly and went into the house and found the little Child with Mary, His mother, and bowed low and adored Him and pulled out their treasures and gave Him gold, incense and myrrh. And God commanded them in a dream not to return to Herod again, and they went on another way back to their country. When now Herod saw that he had been tricked by the Wise Men, he became very angry and sent out and commanded all children in Bethlehem be put to death, and in the whole region, who were two years old and under, according to the time he had spied out from the Magi. Then he got up and took the little Child and his mother with him and came into the land of Israel. But when he heard that Archelaus was king in Judea instead of his father Herod, he was afraid to go there. [i] Wise men – That so translated Greek word (magoi – our magician) indicates first the members of a Persian priestly caste that engage in astronomy and astrology, then general Babylonian and other star-gazing.